Most people believe that dogs can eat basically anything you throw at them. But this isn’t true at all. Dogs aren’t walking garbage disposals. Just like human beings, some pets have sensitive stomachs which are easily irritated by the food they consume. This can be quite challenging for dog owners who often struggle to find a good food to make their dogs comfortable during mealtimes. Your dog’s sensitive stomach may be caused by his diet. Sometimes, finding the best dog food for sensitive stomachs can reduce the symptoms and get the GI tract working properly again. 1 What Could Cause Sensitive Stomachs in Dogs? 6 How can you tell the quality ingredients that must be in the dog’s diet? What Could Cause Sensitive Stomachs in Dogs? Just before you start looking for a good food for your pet, you need to know what is causing the dog to have a sensitive stomach. Dogs, like some humans, are sensitive to some food ingredients and for others, having a sensitive stomach may just be a sign of another problem. The first step to take would be to make an appointment with a vet who will examine your dog. Even though this might feel like investing so much money, remember that buying dog food is expensive as well. You may save some money by visiting a vet, as he/she can recommend a dog food that would suit the particular dog. While you are there, ask for the vet’s opinion about what you have been feeding the dog as well. After ruling out serious conditions such as stomach cancer, you should examine the other things that could cause sensitive stomachs in dogs. In the market today, we have so many food items that some dogs can’t eat. Some other dogs may be sensitive to proteins. One other possibility is that the dog’s food doesn’t have sufficient vitamins, fiber, and minerals, or has too much of another substance, like fat. Sometimes, the dog’s food may be innocent in all this. If your dog is one of those that likes shuffling through the trash or swallows a lot of table scraps and treats, then it may also be another factor causing the upset stomach. Prevents allergic reactions: a lot of dogs may become allergic to regular food, and this is when the need special food to protect their health. Prevents inflammatory bowel diseases: buying special food for dogs with sensitive stomachs could also prevent inflammatory bowel diseases. Balanced diet: a balanced diet helps the dog develop a healthy gut with balanced bacteria. Prevents diarrhea: all dogs display their stomach problems through diarrhea; when the dog is hale and hearty, his stool will have a solid form; loose stool is a caused by food allergy. Reducing the ingredients in the food will help with digestion. Prevents inactivity: tummy problems can cause inactivity, and that can lead to other health problems. Reduces food sensitivities: healthy food will provide nourishment for the dog’s sensitive side. Prevents pain and suffering: when your dog is free from a digestive problem, he will not have to suffer any pain. Prevents allergic reaction to food: Dogs may develop an allergy if they eat the same food for a long time. You should change the diet often to prevent it. Gives them healthy skin: good food can be reflected in the skin of a dog. Special food for sensitive stomach will make their skin healthy and keep them free from skin diseases. 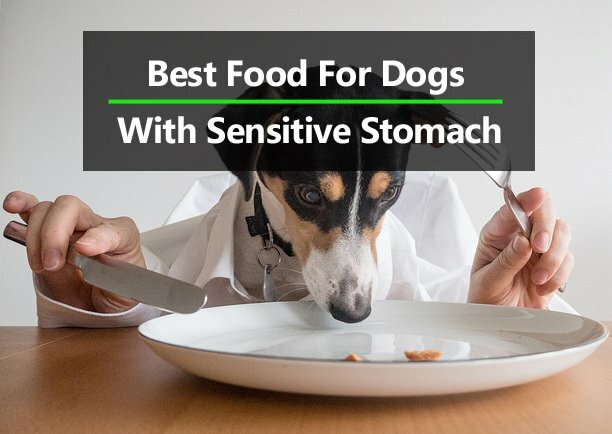 Top 10 best dog food for sensitive stomach. Wellness Simple Natural Limited Ingredient Dry Dog Food is a high quality dry food for dogs. As the name suggests, this brand has limited ingredients and is gluten and wheat free, which can make a big difference for a dog with certain food intolerances or food allergies. In general, dogs do better on a diet with fewer carbohydrates and fillers, and Wellness Simple Natural Limited Ingredient Dry Dog Food does a good job with providing maximum nutrition with fewer fillers and unnecessary additives. The food comes in a variety of flavors, each with different sources of protein and carbohydrate, including: salmon and potato, turkey and potato, lamb and oatmeal, and duck and oatmeal. None of the varieties have eggs, dairy, corn, or wheat, all of which are relatively inexpensive fillers that many dog food companies use to bulk up their product. 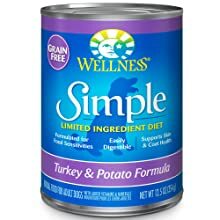 Wellness Simple Natural Limited Ingredient Dry Dog Food is great in that the first two ingredients are always the protein, which is crucial for canine health. This food has very good taste, even some picky dogs such as Terrier, chihuahua or yorkie likes it. Several flavors to cater to picky dogs. The flavors contain just one protein source. It doesn’t have gluten or wheat. A little expensive for large breeds. 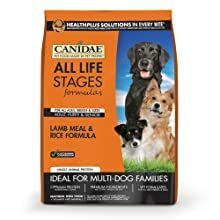 Canidae Life Stages Dry Dog Food is a high quality dog food that is a great choice for dogs with sensitive bellies! While it is not a limited ingredient dog food (which is usually preferable for sensitive dogs), Canidea makes up for it by including a variety of highly digestible proteins and carbohydrates, such as oatmeal and brown rice. The one thing to watch out for with this brand is their ingredients list. Different varieties of rice are listed in the first few ingredients, such as rice bran, white rice and brown rice. Since these are actually all type s of rice, it’s very likely that rice is the primary ingredient in this food, rather than the protein (which is what’s listed.) This actually may be a good thing for dogs with sensitive stomachs, and rice is highly digestible and gentle on a canine digestive system. None of the flavors Canidae Life Stages Dry Dog Food contains any wheat, soy, or corn, all of which are common culprits in dog allergies and digestive sensitiveness. This is definitely a plus! This food is also suitable for dogs of all ages, including puppies and seniors. 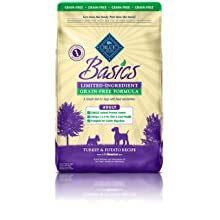 This is great for sensitive puppies that may not due well transitioning to a different adult food. While this is a relatively pricey food, it may be well worth it if it helps reduce or even eliminate your dog’s stomach problems! Doesn’t contain soy, corn, or wheat. It may not a good choice for picky dogs. Natural Balance Limited Ingredient Diets Wet Dog Food is a high quality wet food for dogs. It may be especially good for dogs with stomach issues, thanks to it’s limited ingredients, lack of grain, and highly digestible components (such as pumpkin). 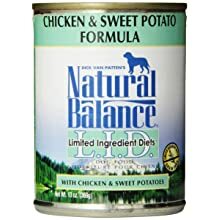 Natural Balance Limited Ingredient Diets Wet Dog Food comes in a variety of flavors, all of which contain few ingredients, such as fish and sweet potato, duck and potato, sweet potato and venison, and wild boar and brown rice. All of the carbohydrates in this food are easily digestible, which is important because it’s often the carbs in dog food that dogs are sensitive to. By using carbs such as sweet potato and brown rice, this brand is much more likely to be tolerated by dogs with stomach issues. This Canned Dog Food may be a great choice for fussy eaters. The food may also help kindle an older dog’s appetite. Whole Earth Farms Grain Free Recipe Dry Food is a good choice for dogs with sensitive stomachs. While it contains multiple protein sources, rather than a single source (which may be helpful for some dogs), the food more than makes up for this by using wholesome and easily digestible carbohydrates and high quality oils. 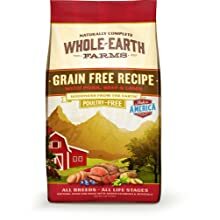 The first few ingredients in Whole Earth Farms Grain Free Recipe Dry Food Pork Beef and Lamb are pork meal, dried potatoes, peas, sweet potatoes, and pork fat, all of which are highly digestible, high quality ingredients. The protein will vary depending on the flavor (the brand has a variety of different flavors, including chicken and salmon) but the ingredients will otherwise be very similar. Whole Earth Farms Grain Free Recipe Dry Food contains Salmon Oil, which is a superior alternative to canola oil, an ingredient frequently found in dog foods. It also contains a variety of added vitamins and minerals, which means your dog will get a huge boost of nutrition without compromising their digestive health. 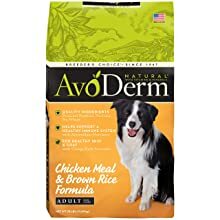 AvoDerm Natural Chicken Formula is high quality dry dog food that may be a good choice for dogs with stomach sensitivity. This is mostly due to the brands ingredients list, which includes high quality protein sources (chicken) coupled with highly digestible carbohydrates, such as rice and oatmeal. AvoDerm Natural Chicken Formula may be a good choice for dogs with sensitive stomachs because it contains no corn, wheat, soy, or animal byproduct meals, all of which can wreak havoc on a sensitive digestive system. Content high quality protein sources. Contains no corn, wheat, soy, or animal byproduct meals. Rice doesn’t actually have much nutritional value so it may not suit for dogs that need a lot of energy. 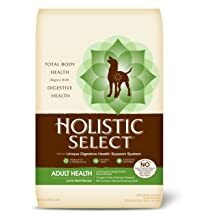 Taking this spot on the best natural dog food for sensitive stomach list is Holistic Select Natural Dry Dog Food. This Dog Food is a relatively complex food, nutrition wise. While it is specifically formulated to be highly digestible, which is important for dogs with sensitive stomachs, Holistic adds probiotics, fibers, and digestive enzymes. All of these additions are definitely represented in the price. This could be a great choice if your dog suffers from digestive issues. Holistic Select Natural Dry Dog Food contains a variety of protein sources, unlike many other foods created for dogs with sensitive stomachs, which tend to have single protein sources. The food contains chicken meal and chicken fat, which are both high quality and high protein ingredients. The recipes also consist of a mix of active probiotics, healthy fibers, and digestive enzymes. When these additives are combined withother healthy natural ingredients, they may help your dog to digest food properly. Overall, the ingredients of Holistic Select Dry Dog Food is a good choice for dogs who suffer from stomach issues. This food is a high quality wet food for dogs. Just taking a look at the ingredients list, we can immediately see that high meat content. In fact, the first three ingredients are: turkey, turkey broth, and potatoes. 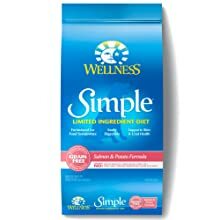 Wellness Simple Natural Limited Ingredient dog food, as it’s name implies, contains only around 10 ingredients, plus a host of added vitamins and minerals. This is great for dogs with sensitive stomachs, or for owners who simply want to know what’s in their dog’s food! The brand has other variants as well as sizes to cater to the taste of the dog. The variants are salmon and peas, oatmeal and duck, lamb and oatmeal, turkey and potato and salmon and potato. Each variant has a single protein and is devoid of wheat or gluten. It may be a good option for picky dogs. Some dog owners consider it among the best dog food for pit bulls sensitive stomach. This food is a good choice for dogs with sensitive digestive systems. This grain free formula, which is packed with high quality protein and delicate carbohydrates. While it comes in a variety of flavors, high quality protein is always the first ingredient, followed immediately by easily digestible carbohydrates (such as sweet potato, peas, and carrots.) 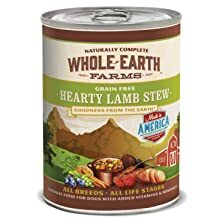 Whole Earth Farms Grain Free canned dog food also includes either olive oil or salmon oil, both of which are superior to the commonly used canola oil (which is less expensive.) This brand also includes eggs, which is very nutritionally complete and easily digestible extra protein source. Since grains are often the culprits when your dog has a food sensitivity, the fact that Whole Earth Farms Grain Free canned dog food is totally grain free is great! It contains no wheat, corn, soy, all of which can be irritating to dogs with sensitive stomachs. This food also contains none of the common emulsifiers often found in canned dog food, which are usually nutritionally useless and can create problems for a sensitive dog. As a bonus, Whole Earth Farms Grain Free canned dog food contains chelated minerals, which attach to the proteins and make them even more digestible! Overall, this is a great choice of wet food for dogs with sensitive stomachs! 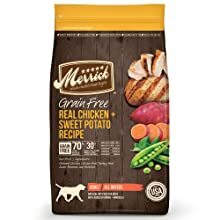 Merrick Grain Free Dry Dog Food contains all the protein your dog could want, along with easily digestible carbohydrates that will go easy on their sensitive stomach. The grain free recipe contains no corn, wheat, or soy, all of which can create a lot of problems for dogs with delicate digestive systems. This food is really easy for your dog to chew, it has been said by many dog owner. Merrick also uses ingredients from the USA and is made in the US- which is very reassuring to many dog owners! Contains all the protein dog needs. Excellent for coat and skin problems. Blue Buffalo Basics Limited-Ingredient Dry Adult Dog Food is a high quality dry food for dogs. It is a great solution for dogs with stomach issues, due to its grain-free formula and limited ingredients. A great thing about Blue Buffalo Basics is that the protein in the dog food is always derived from one source: whether it be turkey, chicken, lamb, or salmon, they don’t mix the different meats! This is usually great for dogs with stomach issues, as it renders the food more digestible. This grain free dog food for sensitive stomach uses turkey as the main ingredient. It may also be perfect for stomach sensitivities because it promotes digestion and immunity. A small pack of 11 pounds can be gotten to test the dog’s diet before deciding on the one to get. Also, this one has formulas fit for dogs of different ages and sizes. Blue Buffalo also uses ingredient such as pumpkin, which is easily digestible and soothing to a dogs digestive track, as well as easily digestible carbohydrates such as oatmeal, potato, and brown rice. Rice is very digestible, so it makes a great addition to dog food for dogs with sensitive stomachs. All the ingredients are gotten from within the U.S.A. This food wasn’t ideal for all allergies, but it’s a great food for sensitive stomach and gas. A dog can have a single symptom or all of them, but if any of these symptoms becomes severe, then you need to speak to your vet as soon as possible. Diarrhea and vomiting are some signs of serious illnesses. Flatulence may also be a sign of a condition or disease that will require immediate veterinary attention. Knowing for sure if your dog’s meals are causing digestive issues is relatively easy, although it may require some determination on your own part. Begin by getting rid of any additional food items from the dog’s diet. This could include treats, table scraps, and anything your dog may enjoy chewing on during the day. You also need to monitor the dog closely to find out if he’s sneaking into the litter box, trash, or any other dirty area that make dogs ill. This will improve the stomach condition and also save him from the veterinary emergency room. When your dog’s stomach doesn’t improve after a few days despite the removal of scraps and treats, and you are sure that he’s finding his way into the trash in your absence, then you need to examine the dog food critically. How then do you spot the ingredients that cause stomach upset? All dogs are different. Some may digest everything that enters their stomach without having a problem, including full rolls of toilet paper. Other dogs may have some discomfort when there’s a mild change in diet. Below are some aspects of dog nutrition that all dog owners should know as it will help them find the best dog food for sensitive stomach and diarrhea. Some dogs cannot digest some types of protein with ease. For instance, if your dog eats a chicken-based diet, switch to another protein source, such as fish or lamb, beef, to see if it will resolve the problem. Sometimes dogs actually need some extra fiber in their meals, just like humans. Beet pulp is one great source of fiber, which digests properly without affecting the digestibility of other nutrients.Some other recommended fiber sources in commercial dog foods include psyllium and inulin. Consult your vet and ask if you could add some fiber to the dog’s diet. When dog food is high in fat,it could be harder to digest as compared to diets which are higher in carbohydrates and protein. Look at the dog food ingredient label to see if excess fats and oils are enumerated as one of the first four ingredients. When it is, it could be an indicator that the dog food is too high in fat and your dog’s digestive system can’t handle it. Compare the current dog food to some other brands to find one that has reduced fat quantities. One easy way to deal with this is by going through the ingredients list to check the fat percentage on the label. Some commercial dog foods have adequate amounts of both vitamins and minerals. However, when you’re feeding the pet a specialty diet, such as a home cooked meal or a raw diet, it is possible that the dog could be having a nutrient deficiency. Talk to your vet to ensure that you’re feeding the dog all the required nutrients for proper digestion. After that, adjust the diet accordingly. How can you tell the quality ingredients that must be in the dog’s diet? Determining the quality of ingredients in your dog food can be a tricky task. Labels aren’t permitted to contain information about the grade or quality of a certain ingredient. Instead, dog owners are allowed to guess following the input of vets, price, and published information. This doesn’t mean that it’s impossible to tell quality ingredients apart. You could try to look at previous clinical studies which were performed on a brand of food. Pick a brand that you believe outperforms the competition by statistics, and do not hold back from contacting the manufacturer directly for information. Newer brands may not have lots of clinical studies because studies take time to finish and evaluate. Another way to know is by checking if the dog food company to know if they have employed a Board Certified Veterinary Nutritionist as one of their staff. This could mean that the dog food company knows about the product’s nutritional value. Knowing the cause of your pet’s upset stomach is the first step to finding the best dog food for sensitive stomach. Other factors may cause a sensitive stomach, but the most likely culprit is food. Test the dog by reducing other treats and concentrating on any of the puppy food for sensitive stomachs listed above. The Wellness Simple Natural Limited Ingredient Dry Dog Food may be a great start as it is easily digestible by all dogs.